The app--for iPhone and soon for Android--uses location detection technology and social media analysis to help you do what you need to do at the airport with less hassle, meet up with people who are also traveling, and keep stats on all your travels throughout the year. 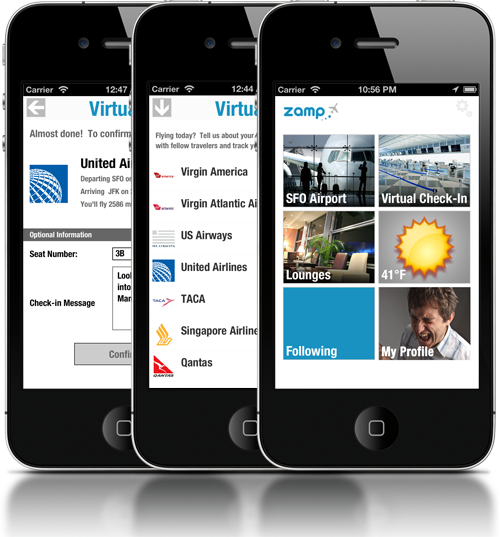 Zamp automatically figures out which airport you're at, and then gets all of your flight details including total miles traveled, gate information, and even your plane's tail number. Once that's taken care of and you're at the gate, the app uses social media data to detect if any of your friends or would-be friends are on the same flight as you are. Using this "ambient social" aspect of the app, you may be able to find someone with whom you can coordinate a ride or share a taxi, or someone who will give you a travel tip. The app also lets travelers use "lounges," where they can share tips about long lines, weather delays, etc. Travelers can participate by entering short, tweet-like messages through Zamp. These messages automatically disappear after the traveler's flight has left the airport. Perhaps the coolest part is the basic analytics Zamp runs on your travel history. You can see the sample "dashboard" here. Zamp tells you which airlines, routes, and airports you've used in the past year, for example, lists all your flights, and plots them out on a map.